Among the many hats he wears, novelist/storyteller/editor Gorman is the unrivaled king of cat anthologists (Cat Crimes Through Time, 1999, etc.). Unfortunately, the eight new stories in this collection aren’t likely to add much luster to this side of his reputation. There’s certainly variety aplenty in the settings, which range from Lillian Stewart Carl’s English manor whose cats out-fop P.G. Wodehouse to Jean Rabe’s 19th-century riverside cave to Mat Coward’s bustling, anonymous mixed-race London neighborhood. And the eponymous heroes get to play every role imaginable. In addition to Edward D. Hoch’s obligatory sleuthing cat sidekick and Brendan DuBois’s feline avenger, there’s the cat as mystical totem in P.N. Elrod’s saga of rein-cat-nation, the cat as red herring in Christine Matthews and Robert J. Randisi’s where’s-that-cat riddle, and the cat as bone of contention in Kristine Kathryn Rusch’s cat-inspired lawsuit. 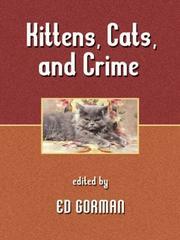 For all the changes they ring on the relationships between cats and crime, however, practically all these brand-new items are stingy with ingenuity, suspense, or mystery. But Gorman does get a chance to shine as cherry-picker with three atmospheric reprints that outclass the competition: John Helfers’s medieval Japanese “Paw-trait of a Murderer,” Gary A. Braunbeck’s hobo-justice “In the Lowlands,” and Gorman’s own “The Christmas Cat,” an Iowa idyll for ardent young investigator Sam McCain (Everybody’s Somebody’s Fool, Feb. 2003, etc.). Nothing like a cat-astrophe, then, but a collection hardly worthy of its lordly subject—or its editor’s long advocacy thereof. Fans may want to wait for an election year.